Great Art is a combination of MULTIPLE Art Enhancers. The Art & Tangle Game is the culmination of a few years of Zentangle and Art lessons, ebooks and videos. 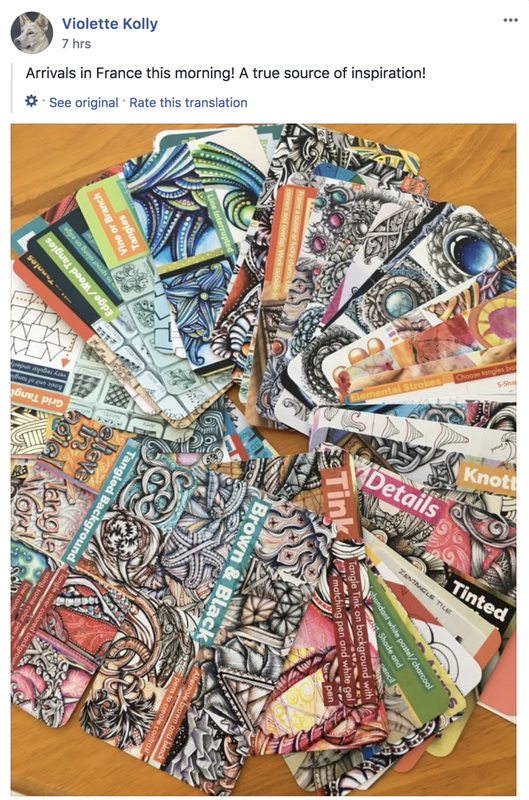 It contains 48 cards, each one with an Art Enhancer or Technique which you can apply to any kind of art, not only Zentangle. You can use each Art Enhancer on its own, however, it is the combination of MULTIPLE enhancers which is going to make your art look fantastic. This game helps you to explore these Art Enhancers in combinations that you would not think of on your own. These 48 cards were made in large BEAUTIFUL Tarot-size cards, in the same type of card as regular playing cards, very smooth and sturdy. Each card measures 4.75 x 2.75 inches (12 x 7cm), which makes them portable enough to carry, yet large enough to view the beautiful inspirational Art Enhancer illustrations. Each card contains one Art Enhancer which could be a Zentangle Technique, a Classification of tangle, or an Art Technique. 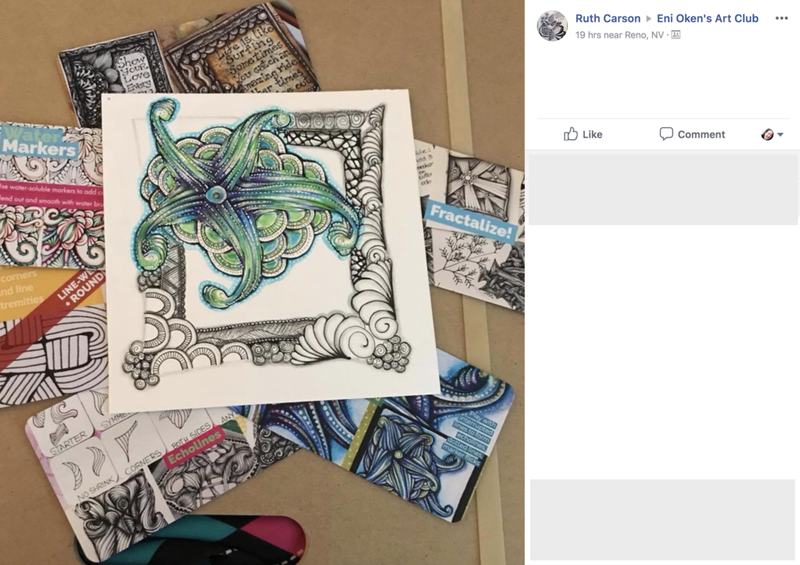 Some are well known in Zentangle world such as "Line-weight and Rounding", while others are a bit more specific such as "Fancy 3D Auras", covered in my lesson Ribbon Showgirl. All 48 Art Enhancers have been covered in my lessons, ebooks and videos found at the Lesson shop. You can play the Art & Tangle game by selecting one or more cards randomly BEFORE starting to draw, to come up with unusual combinations or challenges that you would not think of on your own. For example, you might challenge yourself to use only tangles which use a specific type of Elemental stroke. You can also use the Art & Tangle Game to learn more about your own style and evaluate your art. By counting the Art Enhancers you have added to a drawing AFTER it was created, you learn more about yourself. In my experience, the more Art Enhancers you add, the more interesting and complex the piece (but that's just my opinion!). Keep in mind that this first deck is by no means complete. There are many more Art Enhancers in the world! These 48 cards represent only the tip of the iceberg, and they contain mostly Enhancers that I have taught in my lessons, videos and ebooks in 2015 through 2017. As the list of lessons grows, eventually a second and perhaps third deck will appear. The Art & Tangle Game was developed to serve as inspiration for experienced and seasoned Zentangle artists and it assumes you are familiar with many of the Art Enhancers described in the cards. If you are a complete novice in art and Zentangle, then take some time to learn more about this wonderful method before tackling this game. Most of these concepts can be learned through lessons found at my LESSON SHOP. 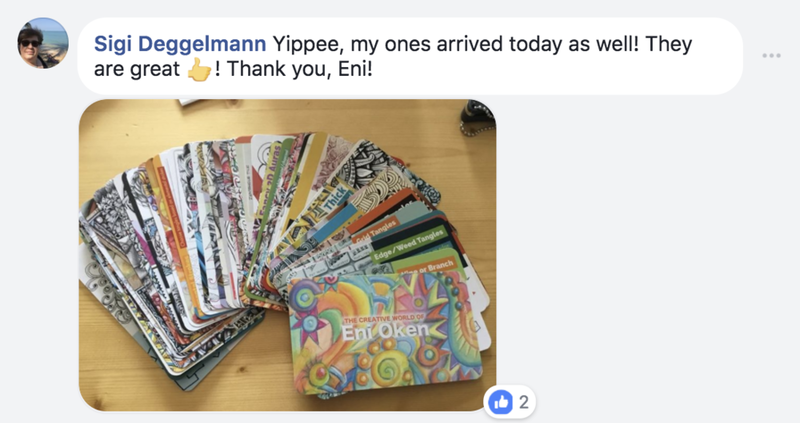 This is what people said about the Art & Tangle card game!